Gloria Garland L.Ac., Dipl. Ac. & Ch. is a licensed acupuncturist and Chinese herbalist with a Masters Degree in Traditional Oriental Medicine. A lifelong horse gal, she works in Oakhurst, California near Yosemite National Park. Gloria's interest in equine Chinese herbal therapy began in 1988, when she sought an alternative (and successful) therapy for her own arthritic gelding. As a result Gloria was inspired to develop Whole Horse Herbs™ with the goal of bringing complementary herbal remedies to the equine community. 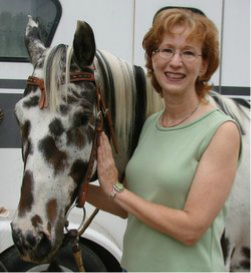 Gloria is the author of Equine Acupressure Therapeutics and a contributing author for a number of equine related journals including: Equine Wellness Magazine, Holistic Horse, Natural Horse Magazine, Equus, Trail Blazer Magazine, American Natural Equine, Central Equine and California Riding Magazines. She has also been a featured clinician at Equine Affaire, Festival of Horses, Equine Extravaganza and The Backcountry Horsemen of California State Rendezvous. She teaches hands-on seminars and classes, empowering horse owners with accurate and useful information and equine health care tools. She shares her knowledge at Whole Horse University an on-line and hands on educational program for horse owners. When she is not working with patients, she enjoys hiking with her dogs, gardening, and exploring the Sierra with horses Lad and Roco. Roco enjoys the crowds during Heritage days. Lad and Roco enjoy a lunch break.